Leicester manager Claudio Ranieri has set his team the target of reaching 79 points this season. The Premier League leaders - on 44 points - drew 1-1 at Aston Villa on Saturday, meaning Arsenal can leapfrog them with a point at Stoke on Sunday. 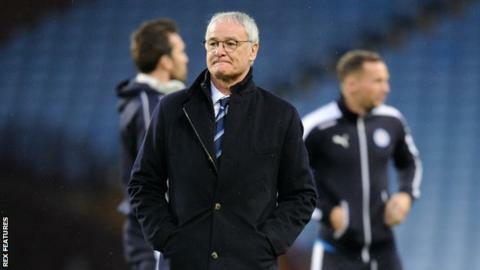 "We achieved 39 points from the first half of the season and we want to improve," Ranieri told BBC Sport. "Our next target is 40 more points from the second half. I know it is very difficult and ambitious but why not?" How many points would Leicester need to win the league? Only three times has the Premier League title been won with 79 points or fewer - but the total has always been enough to finish in the top four. Manchester United won the league in 1997 with 75 points, Arsenal did it the year after with 78, and United repeated the feat with 79 points in 1999. Last term Chelsea finished top with 87, but this year's title is likely to be won with fewer than that. At the same stage of last season - after 22 games - Chelsea already had 52 points and second-placed Manchester City 47. Leicester's two apparent main rivals for the title this year - City and Arsenal - have both got 43 points, one fewer than the Foxes, although victory for the Gunners on Sunday would see them go two points clear on 46. Garde (right) said Villa's performance showed his side "play a quality game"
Of the draw at bottom club Villa, Ranieri said his side had "lost two points", having been pegged back after taking the lead. "We had the match in our hands but that is football. It was a tough game, a local derby. In the second half it was a big battle - a point is OK," he added on Sky Sports. "I know what we are doing is fantastic. Nobody could imagine Leicester top in January." Villa manager Remi Garde said the result showed him his side has the quality to survive in the Premier League. "The fighting spirit and the collective spirit pleased me - we are on the right way," the Frenchman said. "If my players had played like that since the beginning of the season they would not be bottom of the table today. "We showed we play a quality game now and if we keep this spirit I still believe we can create something."